On the auspicious day of Sri Krishna Jayanthi, Anandadham was converted into Gokula. Tiny tots of Sandeepani Sishuvihar and the other children from Samskarvarga, crowded here by 9 am in the morning, to take part in the Krishna Jayanthi celebration. 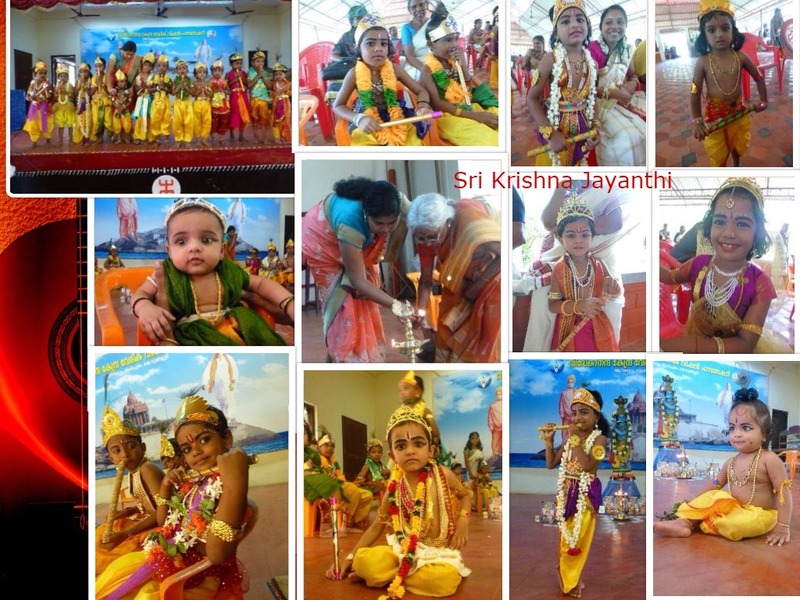 Mothers, fathers, grandparents and siblings of the children were busy decorating their tiny tots into Krishnas. Each Krishna was dressed in yellow coloured veshthi and red or green coloured uttariya, crown on the head and a small flute in the hand, tilakam on the forehead and kundalam hanging from the ears! It was a beautiful sight. There were 20 such Krishnas and three Unni Krishnas. There were Gopikas too around 10 of them. All the little Krishnas were made to sit on stage with the Gopikas behind them. Other children and some elders sang bhajans on Sri Krishna. Smt Mathy Pavitran and Susri Sutapa Das were the judges to select the best child of the lot. All the participating children given token of appreciation for their participation. The programme started at 10.30 a.m with a prayer by the Sandeepani Sishuvihar children followed by Deepa prajwalanam by Smt Amani Amma, a well-wisher of Vivekananda Kendra. After the show the children went to the park to do pradakshina of Sri Krishna's idol at Vrindavan Park of the campus. 'Uriadi ' or breaking of the pot with a stick was the last item of the celebration. All the children enjoyed this thoroughly. There was distribution of prasada after the programme. Programme concluded by noon.